Sat on the wing overlooking the wing of the Airbus that would be ferrying me to Lisboa (Lisbon) from Manchester the nerves started to surface, this would be my first visit abroad for a shoot, not too much to be nervous about then! The flight over couldn’t have been better, having all three seats to myself meant I could stretch out and try and grab some well needed sleep. The views over the snowcapped mountains as we entered Portugal were fantastic. After arriving in Lisboa it was time to sort out car rental and unpack everything at the hotel making sure to check none of my camera gear had been damaged on the flight over, I met up with Gouveia, who would be my host at Esquadra 751 for the next three days. Gouveia took me for a tour around the city sampling some of the local food, beer and architecture it was time to head back to the hotel and get some sleep for my first day with 751. It was a fantastic start to my trip! From Lisboa we drove to Montijo air base, a mere 20-minute drive allowing me to take in some more of the surrounding scenery. Montijo air base, also known as Base Aérea Nº 6 is home to 4 Squadrons from the Portuguese air force and 1 Squadron from the Portuguese Navy. Aircraft based here are both rotary and fixed wing and all have separate roles, however the Airbus C295 of 502 Sqn can assist 751 Sqn on SAR missions. Checking over the on duty EH-101 Merlin that would be used for a SAR mission. Arriving at the Squadrons building at 0800 we had a little time to kill before the morning briefing for everyone, I was given a brief tour around the Squadrons building and their fantastic bar. 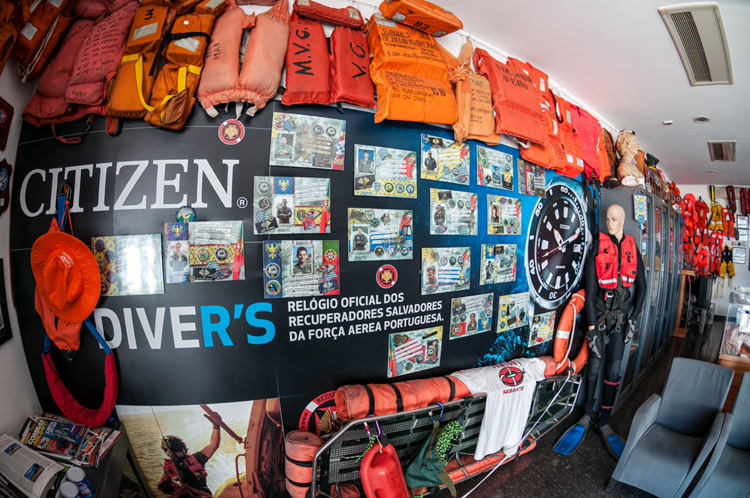 Adorning the walls in their bar are various life jackets, wet suits, stretchers and more from previous rescues. Part of the Squadrons bar, you can see objects that adorn the walls from previous rescues. Whilst departing the mornings briefing Gouveia informed me that our two flights for the day had been cancelled, the Squadrons detachment in the Azores had used up more flying hours than had been allocated and therefor meant that Mondays flying was scrubbed. As we wouldn’t be flying Gouveia took me out to the EH-101 and maintenance hangers for a look around the Cab and also the various stages of maintenance. 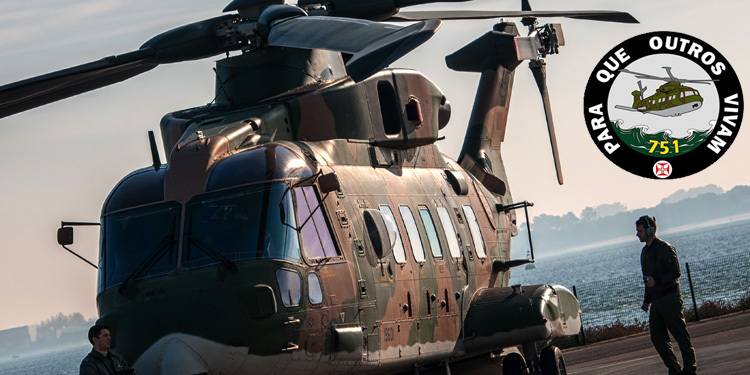 The Squadrons main role is to provide Search And Rescue (SAR) although they can also fly fishery patrol (SIFICAP) missions and Combat Search And Rescue (CSAR) however not all of the Squadrons EH-101’s are able to fulfil the latter two roles. 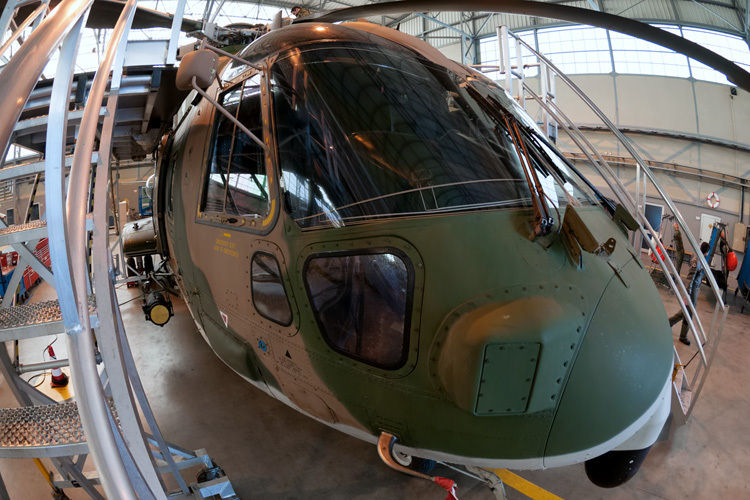 There are four difference stages in the maintenance hangar, the first stage is basic maintenance performed by avionic technicians from 751 whilst the other three stages are contracted to AgustaWestland including deep maintenance for the likes of servicing etc. Unfortunately the Monday wasn’t the most inspiring for photography due to the bad luck of having the flights scrubbed however it gave me the chance to meet various members of the Squadron and think more about the sort of shots that I wanted to capture over the next two days. An EH-101 undergoing basic maintenance in the 751 hangar. Two avionic technicians from 751 perform checks on the massive gearbox and main rotor hub. Day 2 will follow in a week or so hopefully.